Inscribed: filha-yi [daishti?]. jur-daran. savarun bar[’dr?]. naqsha-i savari Tamas Siyafilas Mitkab sahib bahadur ….ajantsi. ‘amal Mazhar ‘Ali Khan. 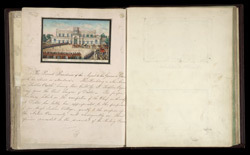 The Present Residence of the Agent to the Governor General, with his retinue and attendance. The building is also known as “Ludlow Castle” having been built by S. Ludlow Esquire, many years the Civil Surgeon of Dehlie. The proper Residency hitherto in the occupation of the chief authority at Dehlie has lately been appropriated to the purposes of an Anglo Indian College - greatly to the surprise of the native community, and consequently in their opinion somewhat to the discredit of the ruling power.